A billboard in the downtown area of the City of Winnipeg, Manitoba in Canada is an eyecatcher with the picture of a bull and its large letters advertising for MTS. MTS is a wholly-owned subsidiary of Manitoba Telecom Services Inc. which provides efficient communication services to Canadians. 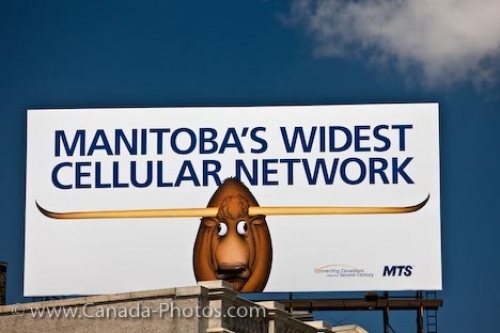 This billboard promotes the cellular network which MTS provides for the people of Manitoba, Canada, a company which has over 100 years experience in the industry. MTS has over 2 million customers and changing the billboards and advertisements keeps people up to date on all the new products. Picture of a large billboard advertising for MTS in the downtown core of the City of Winnipeg in Manitoba, Canada. ... New cellular phones, computers and other electronics are introduced daily and MTS keeps up with the increasing demand for these devices. Billboard in the City of Winnipeg, Manitoba, Canada.